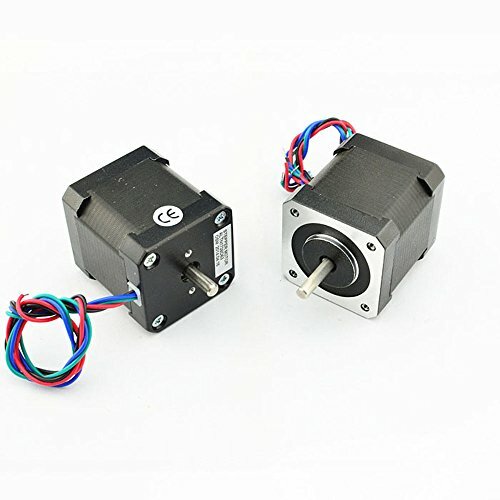 Brand New ultra compact NEMA17 bipolar stepper motor from OSM one of the largest stepper motor manufacturers in China. This is a 2A, 1.8deg, dual shaft model with holding torque 83.6 oz-in/0.59 N.m. The shaft is 5mm diameter and is 13mm out of one side and 19.5mm out of the other side. It has two flat areas on the longer shaft. Connection is made through 4-wires (Black, Green, Blue, Red) 225mm long stripped and tinned. More detailed on the motor dimensions programming and torque are given in the datasheet.. If you have any questions about this product by OSM, contact us by completing and submitting the form below. If you are looking for a specif part number, please include it with your message.